NEWYORK, NY – Quantum Split an up and coming rock/soul band performed this past Friday at Urban Outfitters on 5th Avenue. The event was the first of this kind put on by the New York flagship store. As part of the event MYX Moscato and PBR Beer sponsored liquor to offer attendees that were 21 and up. Also, Sweets By Olivia was in attendance and sponsored cupcakes in a jar. Designer and stylist Adriana Marie was also in attendance and styled Lead Singer, Soleil Laurent. The band performed their singles, “America” “Free” “Father” and “Boss” – while guests were able to shop, enjoy beverages and a sweet treat. As part of the event Urban Outfitters offered discounts and incentives. Quantum Split has been existence for several months and has established a large fan base in a short time. The band recently placed in the top four during Afropunk Battle of the Bands. 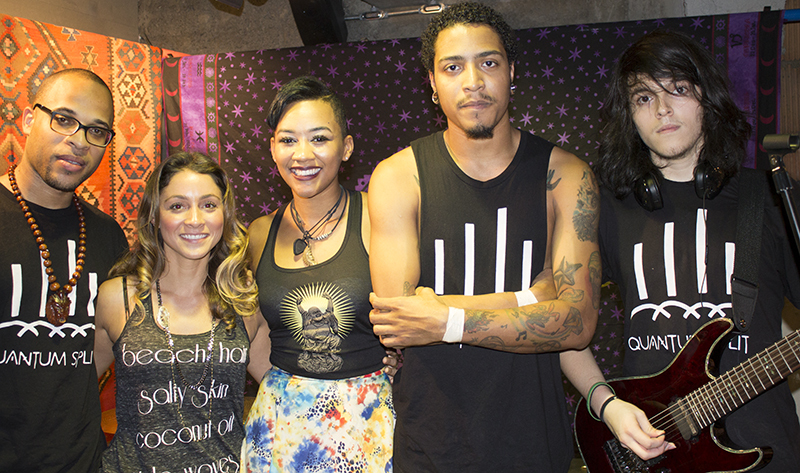 Quantum Split has performed at SOB’s, DELANCY’s, BAM and DROM – among others. The band also recently landed a national promotional commercial. Band members are between the ages of 19-25. The lead singer, Soleil Laurent currently attends Berklee College of Music, in Boston.